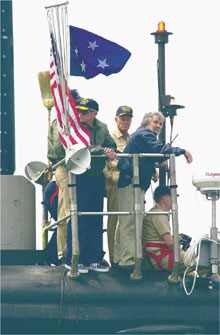 Adm. Frank L. "Skip" Bowman, Director Naval Nuclear Propulsion, mans the bridge with Rear Adm. Jeffrey B. Cassias, Commander Submarine Group TWO, as the submarine returns to General Dynamics Electric Boat , July 30, from their initial sea trials. GROTON, Conn. (NNS) -- PCU Virginia (SSN 774) returned to General Dynamics’ Electric Boat Shipyard here July 30 after successfully completing its Alpha Sea Trials (AST). 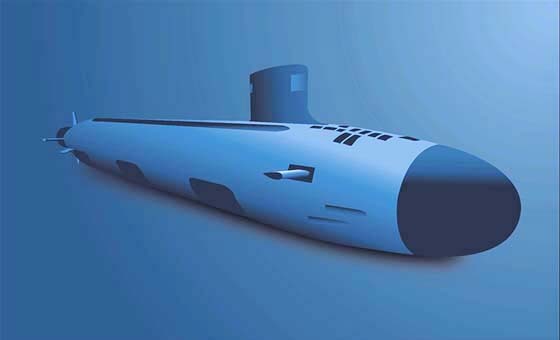 All ships complete an AST, but for submarines, the AST is the first underway designated for propulsion plant testing and tightness dive testing. Virginia’s AST was special because it was the first for a new class of submarine. Adm. Frank L. “Skip” Bowman, director, Naval Nuclear Propulsion, embarked Virginia for the AST and was pleased with what he saw. Virginia performed three emergency blows during the AST. The ship also dove to test depth and maximum operating depth three times. The Virginia crew shut down the reactor and did crew casualty training twice, demonstrating the capability to rapidly restore the reactor and thus, electrical power and propulsion to the ship. Bowman lauded Virginia Commanding Officer Capt. Dave Kern and his crew for their performance. “I was almost blown away by the spirit and enthusiasm by both the shipyard people aboard and the crew in tackling some very difficult challenges, and coming through them with hardly any sleep," said Kern. “The training they’ve gone through in the past couple of years showed during these last three days." Kern also praised his crew, saying their professionalism and sense of accomplishment stretches farther than the previous few days. 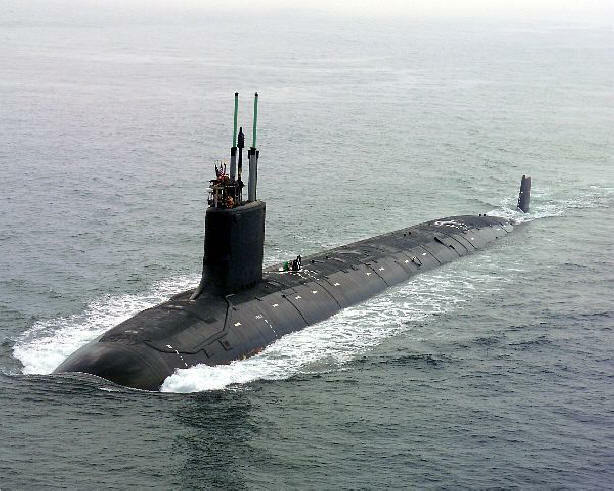 According to Bowman, the propulsion plant also performed flawlessly, noting that Virginia’s power plant is more user-friendly than those on other classes of submarine. “Automation that has not been incorporated into propulsion plants before is incorporated into this one, giving us the ability to reduce watchstanding requirements," he said. "The plant is very resilient - more resilient than previous plants. It’s also built in a modular fashion that makes it quieter." “It incorporates a level of energy density never seen before on submarines, taking up less room. Its completely new design brings the submarine force into the 21st century with electronics, microprocessing, and digital analysis and displays that have not been used before to this extent on submarines,” he continued. 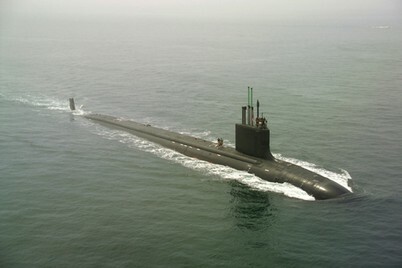 Bowman noted the Virginia-class submarine represents the first of the Navy’s major combatants designed specifically for missions after the Cold War. Groton - As the submarine Virginia returned to port Friday from its first sea trials, there were cable trays missing or dangling from the hull and some sections of temporary hull coating material ripped loose, but its appearance was a point of pride for many. The missing pieces were a testament not to sloppiness, but to speed. At one point in the trials, the Virginia stayed at maximum power for six hours, and the water whizzing over its hull tore off some temporary test gear - merely a cosmetic inconvenience since it will all be removed now anyway. Although the speed it reached is classified, officials were clearly pleased with the Virginia's accomplishments. "She performed as expected, and more," said a grinning Capt. David Kern, commanding officer of the sub. "Everything went great." The Virginia, the first of a new class of submarine, departed Electric Boat early Tuesday morning for its first at-sea trials that included taking it up to its maximum speed, down to its maximum depth, and testing its electronics, radar, sonar and other systems. As the Virginia sailed up a fog-shrouded Thames River just before 1 p.m., shipyard workers and sailors craned their necks to look at the sail, and were pleased to see a straw broom strapped to its uppermost mast. "The broom signifies exactly what it should - a clean sweep," said Adm. Frank L. "Skip" Bowman, director of Naval Reactors. "It ran like a sports car hepped up on high-test gasoline." Bowman said the trials included taking the ship from full speed ahead to full reverse quickly, and "scramming" its reactor, or shutting it down to test how quickly the crew could restore power. The ship did three "emergency blows," which involve blasting the ship to the surface by forcing high-pressure air into its ballast tanks, and took three excursions to its maximum depth. "Every test was completed successfully (and) we were not disappointed at all with any of the tests," Bowman said. The Virginia has a new reactor, more highly automated than any of its predecessors and requiring fewer crewmen to operate and maintain it while providing a power output that is greater than anything previously achieved, Bowman said. Designed to carry 134 officers and crew, the Virginia went through its trials with 206 people aboard, which made for some cramped conditions. Among the riders were personnel from EB and Navy officials such as Rear Adm. John D. Butler, program executive officer for submarines; and Rear Adm. Jeffrey Cassius, commander of Submarine Group Two in Groton. This is a big weekend for the submarine force; in addition to the successful sea trials of the Virginia, it will christen the second of the class, the Texas, in a ceremony at Northrop Grumman Newport News, the Virginia shipyard that has teamed up with EB to build this new class of sub. As the Virginia slipped into the pier following its Alpha trials, guided by the tugs Patricia Ann and Paul A. Wronowski, a contingent of sailors on the pier shouted "Hip, hip, hooray!" to welcome it. The Virginia is reportedly being readied for a second round of trials this weekend. Although the Navy would not officially comment on exactly when the ship might take to sea again, Kern observed that it will be "within days" and said he is comfortable with the quick turnaround schedule. In fact, he joked, one reason the Virginia overshot the pier slightly on its way up the Thames was because he wanted to proceed up to the Naval Submarine Base and put the sub into immediate operation. "They had to drag me in here," Kern said. "Virginia is ready for anything." As EB welcomed the Virginia back to its dock in a brief ceremony following the trials, dozens of crew under Ship's Manager Thomas C. Berl were streaming aboard the ship to fix any problems that had been noted and get the sub ready for sea again. "It's good to know we're almost to the end," said Berl, noting that this was the first submarine he has seen through sea trials. The Virginia will soon be delivered to the Navy after a few more trial runs and some final fine-tuning. "It will be with some sadness that we see her leave for good, but it's also good to know we did it," Berl said. Sonar Technician 2nd Class Joshua Fredrick, who has been in the Navy for six years and was assigned to the Virginia two years ago, said normally when a submarine is taken to maximum depth there are others on board who can reassure the crew that it has been done before. On the Virginia, it was a little unnerving to realize nobody on board had ever taken the submarine to that depth. "It was pretty tense," Fredrick said. "I was kind of excited. It was good to know we could go down that far." Fredrick said he volunteered for duty on the Virginia "because it's the first of a class." "It's something new, nobody had done it before, so you get a chance to go do something nobody has done before," he said. Machinist Mate 1st Class Derrick Jones said most people on board were too busy to be overly worried about testing a new technology. "You've got a million things that go through your mind, a million different casualties that can happen, and what you're going to do if they happen," he said. Fire Control Technician 2nd Class Patrick Powers said that heading out of the Thames and coming back were particularly challenging because of all the summer traffic on the water, including about a dozen pleasure and ferry boats that came in as the Virginia was maneuvering into the dock. "But everything came together, and it worked well," he said. Bowman said the Virginia is the first Navy sub designed after the end of the Cold War specifically for the challenges of the 21st century, with features that will enable it to work more effectively in shallow, near-shore water, and to support Special Operations forces. "We need it today for tomorrow's missions," Bowman said. "It's a ship for the 21st century." "This ship is exactly what the Navy needs, when it needs it," agreed EB President John P. Casey, who was on board during the trials. "There is no substitute for the Virginia-class submarine."